Chewing gum/bubble gum is a pop-culture element so rooted into modern society that it’s impossible for our generations (the gum-chewing, bubble-blowing generations) to envision it otherwise. As kids, we used to go for the sweet flavored types, the ones that came into a multitude of colors or flavors. As adults, if we lost our sweet tooth along the way, we changed directions when it comes to chewing gum. We mostly go for the minty ones, which are great for oral hygiene. No matter your age or social status, for some reason or another, at some point in space and time, you’ll find yourself the benefits of chewing gum. You might think that the product in question is a characteristic of modern 20th and 21st century society, but that’s far from truth. The “ancestor” of chewing gum originated in antiquity, and it can’t be attributed to a single civilization. The Greeks were chewing on mastic tree sap, the Egyptians had a mixture of sap and spices (cinnamon, frankincense, myrrh etc.) and the Mayans and Aztecs chewed Sapodilla tree sap. The habit of chewing gum (or its various alternatives) stood the test of time because, apart from flavor and texture, chewing has its benefits. It has been demonstrated that chewing gum can do wonders for both the memory and the ability to concentrate. There are caffeine-based chewing gums that are best suited for the job, but any sort of gum will do well too. An NBC report has shown that chewing is in direct correlation with memory enhancement and improved test scores, due to the increase of physiological activities like blood flow, blood pressure, and heart rate. The increase of blood flow in the brain means higher oxygenation, which makes for better brain functions. Because chewing increases mental alertness is also highly recommended for kids with learning problems or mental disabilities. Mental alertness is always beneficial, especially in a survival situation where you’ll need to be aware of everything that goes on around you, to make fast decisions and act quickly as your survival depends on every step you take. According to his scientific study, chewing gum is a very powerful nerve tonic because it helps calm down the nerves and alleviates negative moods. It’s exactly for this reason why chewing gum is included and distributed amongst the soldiers that find themselves in a war zone. Chewing gum helps reduces the levels of cortisol, which is a hormone secreted by the adrenal gland as a response to high levels of stress or too low levels of glucose in the bloodstream. Increased levels of cortisol can be beneficial on short-term periods, but on longer periods of time they can be detrimental to cognitive functions and can even lower the immune system recovery. Because chewing gum contains small amounts of sugar, it can also serve as a small reserve of energy. Having a pack of your favourite gum on you will not only supply you with that tiny bit of energy, but it can also increase your morale and distress your jaw muscles and lower anxiety. So leave some room in your survival kit for a couple of packs of gum. 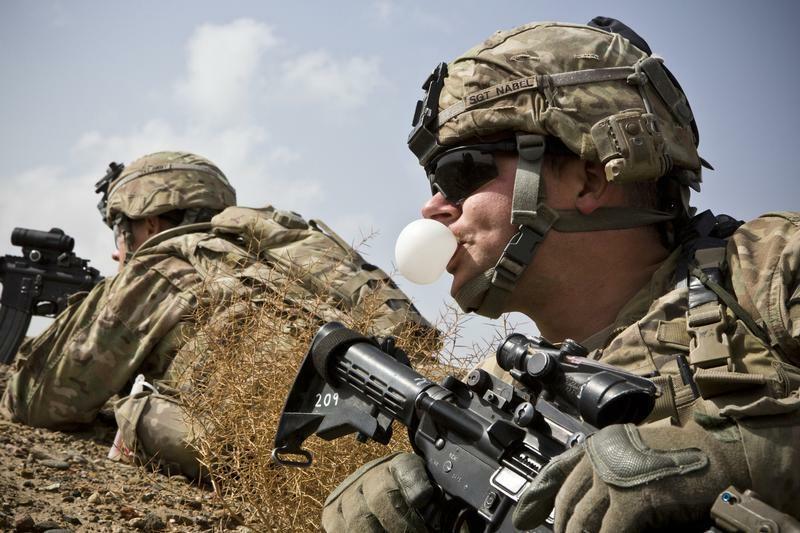 The military (and trained combatants in general) use chewing gum as a means of suppressing hunger when the opportunity of eating is not available. 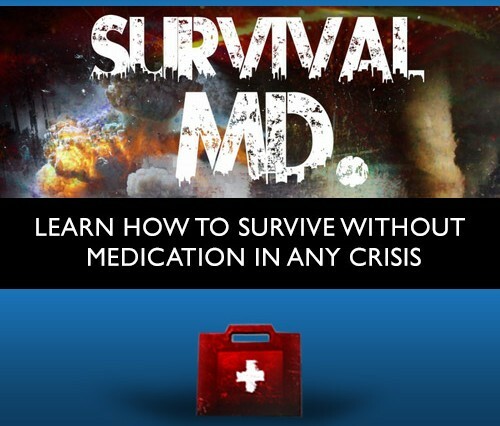 The same principle can easily be applied in a survival situation, especially if SHTF and you find yourself a bit short on food supplies. 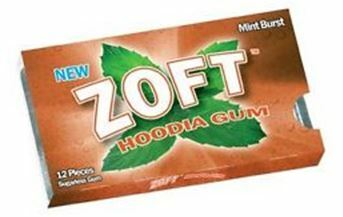 The Zoft Gum is a very potent appetite suppressant and you can get 5 packs for about $10. Believe it or not, not only is there a gum to fight of hunger, but there’s also one that can quench thirst. The Quench Gum was primarily made for athletes in order to keep them hydrated as much as possible during periods of physical effort. It’s packed with 5mg of potassium (K) and electrolytes. The Quench Gum is available on the market in costs about $9 – $10. Chewing gum can be very supportive when it comes to digestion. Chewing constantly will increase the levels of saliva, which in turn will boost the quantity of digestive acids in the stomach. This is achieved with the aid of xylitol, which is found in most chewing gums. Apart from chewing, there are a lot of other unorthodox uses for gum. 1. Bait – surprisingly, you can use chewing gum as fish bait, just chew it a little and place it on the hook; it’s very efficient for catfish and it can also lure crabs if you place it on the crab line! 2. Radiator patch – this is a good temporary solution for a leaky radiator; it may hold long enough for you to reach a mechanic. 3. “Magnet” – it can be very useful if you’re trying to retrieve small objects from a nearly unreachable place; just place some gum on the end of a stick or a piece of string and you’ll be able to recover that lost ring or keys in no time. 4. Window fixer – if you have a loose window pane, don’t worry too much about it; get a stick of ordinary chewing gum, chew on it a little and simply place it as putty. You’ve probably been chewing gum for some years now, without knowing the benefits that ordinary chewing gum had to offer. Now you know, as the wonders of chewing gum are irrefutable. No matter who you are or where you’re at, always have a pack of gum on you; you can never tell how and when it will save the day. Food! We all do it, we all eat. Not only because we have to in order to survive, but also because we like it. Most cultures are unique when it comes to culinary treats, with at least a couple of dishes to set them easily aside from the rest of the world. Cooking may come in different shapes and sizes, but the raw material is (more or less) the same everywhere. We need organic material as fuel. But the organic material we ingurgitate may sometimes be infected by pathogens that will cause us harm. The food or beverages that contain certain bacteria, viruses, parasites or even chemicals will cause great distress and irritation to the gastrointestinal tract. Most of the gastrointestinal afflictions are acute; they manifest themselves rapidly, with fever diarrhea and vomiting and won’t last more than a few days, even without medical treatment. Others, on the other hand, will manifest themselves way more severely and will cause a rapid death if left untreated. 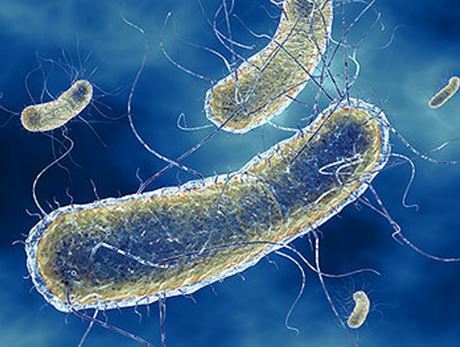 This tiny bacterium (Salmonella enterica) is one of the most common and wildly spread foodborne pathogens on the face of the Earth. It lives in the intestinal tracts of animals and it’s transmitted to humans through food that hasn’t been properly washed and that previously came in contact with animal waste. What makes it dangerous and so wildly spread is the fact that it’s practically impossible to detect. Diseased animals manifest no exact symptoms; nor will the food products that get tainted. It’s not resistant to high temperatures, so cooking the food properly will destroy the proteins that make up the bacteria. If not, hell will soon follow. Within 12 to 72 hours from infection, the pathogen will make itself “visible” through acute abdominal pain and cramp, fever and diarrhea. The diarrhea is severe in this case, so drinking plenty of fluids is a must, in order to avoid dehydration. In a strong and healthy individual, the disease shouldn’t last more than 5 – 7 days. Medication is necessary only if the infection has already spread to the intestines; also if the infected person has a compromised immune system or is an elderly citizen, that will have problems fighting the disease on his own. It can sometimes lead to a complication known as Reiter’s syndrome or reactive arthritis, which causes painful joints, painful urination, eye soreness and chronic arthritis. The best way to avoid salmonella infection is it to cook your food carefully, especially meat and eggs. Also known as trichinellosis, is a disease that’s easily contracted by humans that consume meat infected with the larvae of the trichinella worm (Trichinella spiralis), be it from domesticated pigs or other wild animals. The larvae are incased in a cyst in animal meat. After ingestion, it gets in a human host, where the digestive acids found in our stomachs dissolve the cyst and release the worm. 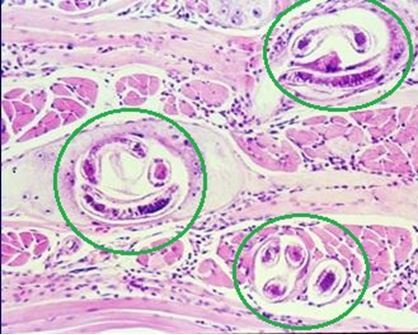 They mature in a couple of days in the small intestine. They will mate, lay eggs and from these eggs small worm will result that will make their way to muscle tissue (through the arteries), where they’ll incase themselves in cystic form again. In an attempt to fight the invasive creatures, you’ll body will suffer nausea, vomiting, diarrhea, acute stomachaches in the first 2 – 3 days after eating the tainted meat. After the worms have matured and start reproducing (2 – 8 weeks), you’ll also experience fever, chills, coughing, eye-sealing, headaches, itchy skin, joint pain and irregularities of the digestive system (constipation or diarrhea). It’s a disease that should not be left untreated. The best way to avoid getting trichinosis is to cook meat at about 160°F, a temperature that will destroy the cysts. You can also freeze you pork for 20 days in order to kill the worms, however, this might not work when it comes to game animals. 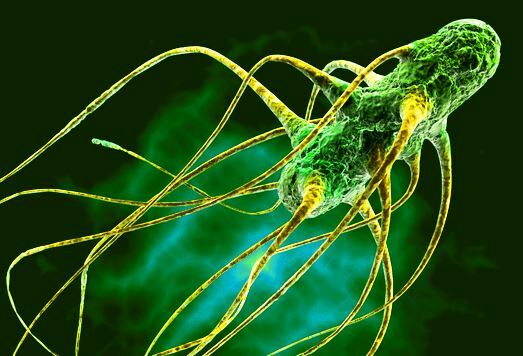 The Escherichia coli is a large group of bacteria, out of which most are harmless. The one that’s able to cause havoc is called the O157:H7, and is part of the STEC group (the E. coli that produce the Shiga toxin). They’re mostly found in the intestines and stomachs of ruminant animals (cattle) but also in sheep, goats, elk, deer etc. When the animal is eviscerated, the intestines might get cut and spill out on the meat, immediately infecting it. The most common method of spreading the bacteria is through ground meat, but it was also found in milk and other dairy products. Vegetables or fruits that come in contact with infected animal waste will also get tainted. Although it doesn’t manifest itself in any way in the animal hosts, in humans it can cause fever, nausea, vomiting, cramps and even bloody diarrhea. The infection spreads rapidly, so that about a third of the people infected will get hospitalized; about 10% of those that get hospitalized will die. It’s most dangerous when it comes to children ages 5 – 10. They risk of developing hemolytic-uremic syndrome as a result of the E. coli infection, which can lead to kidney failure. You can avoid E. coli infection by regularly washing your hands, washing vegetables and cooking your meat at a temperature of at least 160°F. To avoid getting dangerous foodborne diseases, hygiene is a must. Always wash your hands, your food and avoid eating from unreliable sources. If you manifest any of the symptoms that I’ve listed above, check with your doctor immediately and don’t leave anything to chance. Most of the incipient symptoms are common in most type of food-related infections, so it’s hard to tell on your own whether you’ve contracted something that’s life-threatening or not. Vaccination has become a real issue lately, not only in the US but worldwide. The controversy is far from being over, as people seem to be separated into two sides when it comes to vaccination: those who approve of vaccines and those who oppose them. As a parent, choosing a side is a great responsibility, because, in this clash, only one side can be ultimately right. And the overall wellbeing of your children will depend on your choice. The first advocates for vaccination you’ll come across will be your local pediatrician, but don’t let yourself persuaded that easily. He’ll have nothing else in mind than your kid’s health, no doubt about that, but keep in mind that he’s the result of a medical system that has proven to be flawed before. And more so, the vaccination standards and regulations are all directed by the AMA (the American Medical Association). The obvious question is whose best interest does the AMA hold: that of our children or that of the pharmaceutical corporations (whose only purpose is financial profit)? Throughout modern history, there have been several issues with many vaccines on the market. Those who claim otherwise are simply ignorant or ill-intentioned. RotaShield (the Rotavirus vaccine) falls into this category. It was removed from the market in late 1999 when it was demonstrated that there are links between bowel malfunction (obstruction, chaotic bowel twisting) and the vaccine itself. It was a great deal at the time, and the case is real as you clearly see for yourself here. The vaccine that followed (RotaTeq) was supposedly the new and improved version of the RotaShield vaccine. Although it doesn’t appear to be as destructive as its predecessor, it too seems to be causing bowel afflictions; you might find it hard to believe, but RotaTeq is still available on the market. Another famous and controversial case of vaccine malfunction has been recorded in February 2002, when GlaxoSmithKline (a preventive vaccine for Lyme Disease) has been withdrawn from the market. The manufacturer claimed poor sales, but the truth of the matter was that compelling evidence pointed out that the vaccine itself was responsible for worse cases of arthritis than the disease itself. You can read all about the untold truths about vaccines in this full report here. In 2011, the I.O.M. (the Institute of Medicine), has submitted a report for further proof that certain vaccines can cause undeniable side effects. Their studies have shown that the Chickenpox Vaccine can afflict children with immunodeficiency (but not only) with hepatitis, meningitis, encephalitis or pneumonia. The Measles-Mumps-Rubella (MMR) Vaccine favors encephalitis, febrile seizures and Arthralgia (Short-term joint pain) in women and children. The HPV vaccine seems to be the cause of anaphylaxis in yeast-sensitive females and as overall side-effects, all vaccines can cause syncopes (fainting) or arm inflammation. • Formaldehyde is a carcinogenic fluid (used primarily in embalming corpses) that can cause respiratory distress, liver damage, reproductive deformation, gastrointestinal problems and various forms of cancer. Another flaw of this chemical is that it can neutralize the virus in the vaccine, which will make the vaccine completely useless. • Thimerosal is basically mercury. Every vaccine contains about 25 mcg of Thimerosal, and according to the EPA, the safe limit for humans is about 5 mcg. It’s very neurotoxic and it’s been linked to autism. • Aluminum phosphate it’s dangerous because it reacts to mercury and it increases its toxicity. Considering that every vaccine already contains about 25 mcg of mercury, the recommended dosage is exceeded from the go. • Sodium chloride inhibits growth, prevents normal muscle contraction and affects the circulatory system. • Monosodium glutamate (MSG) when injected, it becomes chemical unstable and turns into a neurotoxin; it’s been linked to brain damage in children and CNS (central nervous system) disorders. • Phenoxyethanol can disrupt the central nervous system and can gravely affect the liver or kidneys. • Glycerin is known for causing gastrointestinal damage, lung damage, liver and kidney shutdown. • Bovine cow serum causes chest pain, low blood pressure, lupus, arthritis and can damage connective tissue. These are only some of the most damaging chemicals used in a vaccine. The list is much longer, be sure of that. So before considering vaccination (for yourself or your family), do some research first. Listen to both sides and make up your mind whether the shot is worth it or not. At the end of the day, the damage caused by the “cure” can be far greater than that of the affliction you’re trying to prevent. Stay safe, stay informed and don’t be fooled by advertisements.